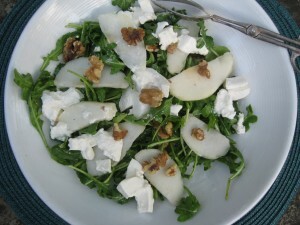 The star of this salad is the Anjou pear. These pears are extremely juicy, with a hint of citrus, perfect for salads. 1/2 a ball of burrata cheese chopped and crumbled. 1- Place the cleaned & dried arugula, walnuts( reserve a few of the walnuts for the top of the salad) and salt in a large mixing bowl. Add the olive oil and toss to coat. 2- Transfer the ingredients to a serving bowl. 3- Sprinkle the chopped Burrata over the top of the salad. 4- Thinly slice the pear on a cutting board , saving the juice. 5- Fan the pear slices over the top of the salad, then pour the remaining pear juice over the top of the pears. 6- Sprinkle the remaining walnuts over the top of the plated salad. This entry was posted in Recipes, Uncategorized and tagged Frank Baldassare The Missing Ingredient gluten freeTV show, Gluten free lifestyle The Missing Ingredient, gluten free recipes, Healthy Salads, Pear walnut salad. Bookmark the permalink.